Joff Winterhart is an illustrator and film-maker and plays drums in his band, Bucky. He lives in Bristol, where he walks his greyhound, Peep-Peep. He is the author of Days of the Bagnold Summer, which was shortlisted for the 2012 Costa Award for Best Novel. "Beautifully drawn and exquisitely written...confirms Winterhart as one of the most talented graphic novelists in the UK." "Masterpiece is an overused word in reviews and ordinarily I avoid it with much the same determination as Keith tries to avoid getting crumbs on his work trousers. In this case, however, it is the only one that will do. Winterhart has delivered a perfect book"
"Few of us bother to visit the worlds Joff Winterhart describes in Other People....[and] one can hardly imagine the characters being interested in buying offbeat comic books, but if they were to pick this one up, they’d see themselves delicately reconstructed with a vibrant love and boundless empathy....Illustrated with a jangly and tender elegance that looks and feels like nothing else on the shelves. Even in the prose aisles, you’d be hard-pressed to find a piece of literary fiction as nuanced and beautiful as this." "With mournful ink-and-paint drawings and a talent for wordless suggestion, Joff Winterhart's comics create a sad and very British kind of underdog comedy... At heart, this perfectly observed comic is a story about recovery. It's also one of the best books of any kind that I've read all year." "Extremely original, funny, touching and beautifully observed in both the drawing and the writing. There is probably no truer portrait of teenage and parental angst." "My graphic novel of the year . . . I love this book so much, I would have to instantly excommunicate any friend who didn’t feel the same way—though such is its greatness, this won’t ever happen." 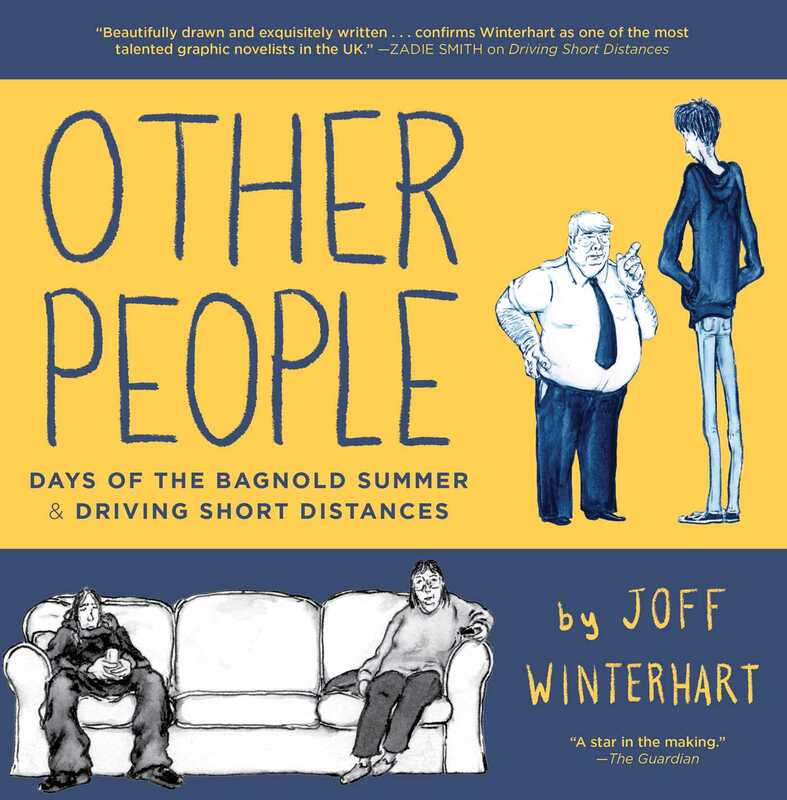 "This graphic novel poignantly examines quarter-life crisis and surrogate father-son relationships... Joff Winterhart's illustrations are marked by their grounded realism, and he explores the anxieties of being a young adult and the repetitions of small-town life. The book captures not only the central characters' relationship, but also the familiar feelings of regret and boredom." "Impressive....Winterhart’s wispy illustrations deftly capture the delicate vulnerability of his damaged characters. Both works are quiet knockouts: The formal command of the first is masterful, but the emotional expansiveness of the second gives it the decided edge. The one-two punch confirms Winterhart as an exciting and remarkable talent to watch." "In his wry depiction of two awkward young men’s long, lonely summers, Winterhart captures the claustrophobia of being a moody, misfit boy in a monotonous town....Winterhart’s blue and brown brush strokes depict the richness of mundane minutiae: the carpet-like quality of Keith’s nosehair, the tender wrinkles around Sam’s mother’s eyes. Neither Sam nor Daniel plunge fearlessly into life, but as days stretch into weeks, they slowly take baby-bird steps toward their dormant ambitions. Throughout, Winterhart manages to illustrate the banal without ever becoming boring." "Both [Days of the Bagnold Summer and Driving Short Distances] are quiet affairs where inner struggles dovetail with the challenges of interpersonal dynamics, executed with deep sensitivity and sly humor. The characters can appear stiff, like positioned figurines rather than people, yet the rich detail with which Winterhart renders their faces and fingers, combined with his superb ear for dialogue, breathes indelible life into them. Keenly observed."